the leading small business financial software. Follow along and learn how to customize bookkeeping, process invoices, manage payroll, track inventory, run reports, and much more. You'll also learn how to use the new and improved features, such as the new calendar, the batch worksheet function, and the Lead Center. 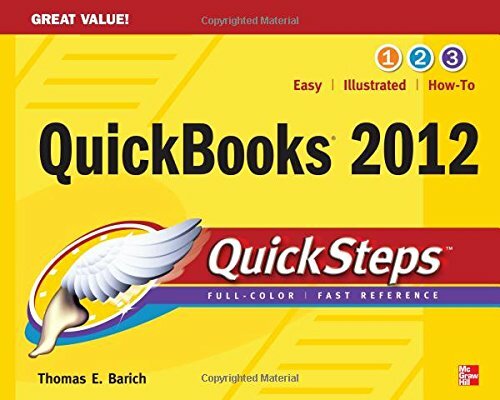 Get up to speed on QuickBooks 2012 in no time with help from this practical, fast-paced guide. Use these handy guideposts: Shortcuts for accomplishing common tasks Need-to-know facts in concise narrative Helpful reminders or alternate ways of doing things Bonus information related to the topic being covered Errors and pitfalls to avoid Thomas E. Barich, a QuickBooks consultant, has been using QuickBooks software for more than a decade. He is the author of QuickBooks 2011 QuickSteps and technical editor of QuickBooks 2011: The Official Guide.